The HFPA is to donate a record $1,567,650 to 50 diverse entertainment-related and charitable organizations this year. The donations, which will be presented at the annual installation and grants luncheon at the Four Seasons Hotel in August, are for a wide range of projects, including the preservation of films, higher education, training and mentoring and the promotion of cultural exchange through film. 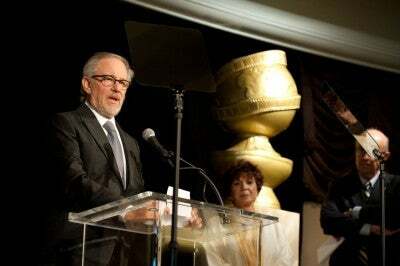 Steven Spielberg accepting a check on behalf of the Film Foundation at last year's luncheon. The sum is $300,000 more than last year and brings the amount given by the HFPA over the years to more than $15 million. The president, Theo Kingma, said: "We try every year to give as much as we can to these highly deserving organizations. It is gratifying to know that our efforts are appreciated and we are helping to further the cause of education and film preservation." The Film Foundation will receive the largest amount---$350,000---for the preservation of historically important films while the Sundance Institute will receive $100,000. Other recipients include FilmAid International, which is to receive $50,000 for screenings and filmmaker training in Kenyan refugee camps; American Cinematheque ($40,000), L.A.C.M.A ( $75,000) and UCLA ($90,000). Smaller donations will go to theater groups, musicians and storytellers foundations, film archives and youth projects. For the first time the association is also giving scholarship/fellowship endowments to a dozen organizations, ranging from $100,000 over five years to the American Film Institute, Columbia University, New York University and UCLA, to $10,000 over five years to Los Angeles City College.